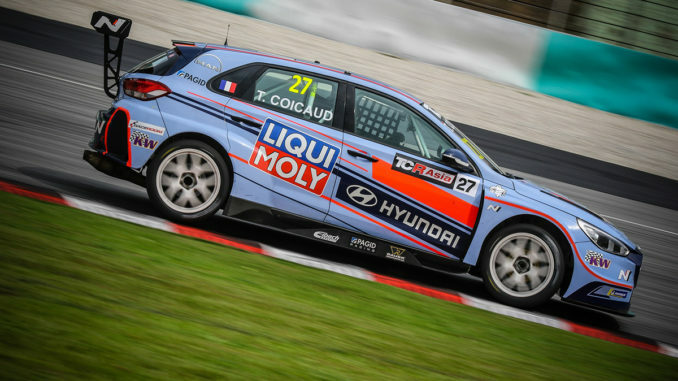 It was an incident filled TCR Asia Round 2 where Theo Coicaud had to fight for the entire duration of the race for his fourth placed finish while Luca Engstler ended his race early after a contact while fighting for third. The morning race at Sepang International Circuit today started with a reverse grid order that saw Coicaud and Engstler line up in 9th and 10th respectively. Both drivers had excellent starts, putting their Hyundai i30 N TCR in the top five by turn 1. Just ahead at turn 2, a collision ensued and while Engstler managed to avoid the melee, Coicaud was caught up and dropped back down the order to 12th. From there Engstler was up ahead fighting for third whilst Coicaud slowly overtook his competitors one by one and was up to 8th by the next lap. At every lap the Frenchman was gaining positions but midway through the race, he was tapped into a spin which dropped him back down to fifth but as he recovered he was immediately on pace and managed one more overtake but ran out of race to make the podium. In the end, Coicaud took fourth for the team. “I started in P9 and had a really good start and was up to P4 by the first corner but then the two cars in front of me just touched and I had no choice but to go straight and I lost all the places and was almost last. “After that I managed to fight back up to P5 and as I took an Audi on the outside, he braked too late and bumped into me and I spun again and I had to come back again. By then it was too late to go on the podium. If it wasn’t for this contact, I would for sure have been able to get a podium but that is racing, sometimes you have no choice. Today we managed to show that we had a really good pace, the car managed amazing lap times and it was perfect” ended Coicaud. While Coicaud fought his way up the grid, Engstler who was up ahead in the first half of the race and was putting pressure on the car in third. He made a few moves, they touched a few times but one manoeuvre on the opening of lap 6 cost the German his race. He nudged his competitor a little too hard and spun himself out into the gravel. “In the beginning I tried not to take that much risk as the others did and then there was a big mess in the first corner, a lot of cars spinning and contact and all but I managed to get through. “From there the race was a bit difficult, I saw that I was faster than the car in front of me but he did a good job in blocking. I tried different things, tried to jump in on the inside and then out and he directly closed the door and we had contact. Then I knew I had to keep going because my goal is always to win the race, I am not here to finish fourth or third. So I tried another time, the car was a bit light under braking, we touched and then I spun”. “but that is racing. Of course I learn. It’s still a long way for me, still a lot to learn. 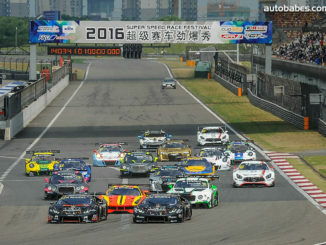 There is still four race weekends to go and at the moment I am just looking forward to Zhuhai. I’d be happier if I can jump on the plane now and go to Zhuhai and clean my mistake but that’s it, we will see”. “It wasn’t as fun as it was yesterday, I have to say. At the end of the day we have to say that maybe Luca was a little too over-enthusiastic and he ended in the gravel trap. Unfortunately we lost the Championship lead for Luca but I am sure he will fight back and he will learn from it. It was a hard lesson to learn for him. Yesterday we were happy and celebrating but today we are down to the ground but that is how racing is. “But Theo made up for it. He really showed that he has a fighting instinct. He was already in the front after the start of the race and then he got hit, fall back down the order got back up to fourth or fifth and got another hit. The driver came to apologise but that doesn’t change the outcome. But we are all super proud of Theo that he made it back up to fourth. He never gave up. He showed the character of a true race driver. I am also thankful for the team as always. Taking into consideration that Theo’s car was severely damaged by the second hit, it showed the true nature of his performance and of the car’s ability”. TCR Asia continues with a visit to China for three race weekends beginning with Rounds 3&4 at Zhuhai International Circuit on 3rd to 5th May 2019 and then to Shanghai and Zhejiang in June and July respectively. The season will end with Rounds 9 & 10 in Thailand at the crowd favourite Bangsaen Street Circuit. 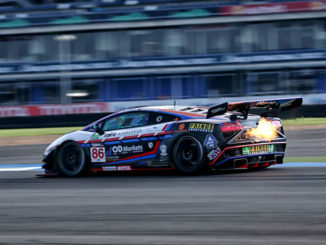 The team is supported by Eibach, Hyundai, Liqui Moly and Pagid Racing. The 2016 GT Asia Series, by the numbers..